A good friend of mine has been fishing off the shores of Alaska and Mexico this past summer and catching oodles of amazing halibut, yellowtail and blue fin tuna. And I'm lucky enough that this friend shares his bounty with us all! I'd been wanting to make the Miso-Glazed Cod recipe from the Bite Me cookbook for a while, and decided to use the lovely halibut my friend caught me. Any mild white fish is fine for this recipe, so use something yummy, fresh and seasonal if you can. 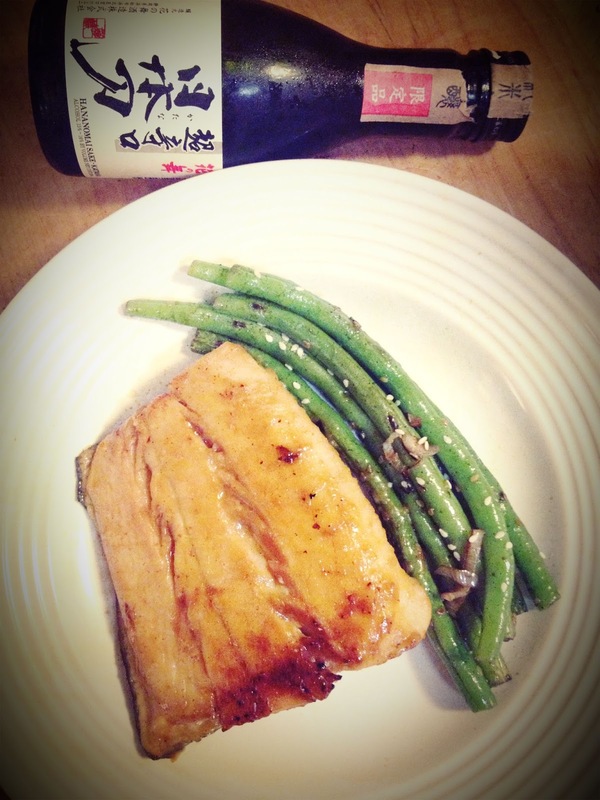 The marinade uses both sake and mirin, which is a rice wine similar to sake but lower in alcohol content and used frequently in cooking. - In a medium sauce pan over high heat, add the sake and mirin, and boil for 30 seconds. - Turn heat to low and add the miso paste and soy sauce, stirring until the paste is dissolved. - Add the brown sugar and turn the heat back onto high, stirring until the sugar is dissolved. - Remove from heat and let the marinade cool down to room temperature. - Pat the fish fillets dry before adding into a large plastic bag. - Add the marinade to the bag and seal. - Let the fish marinate for at least 12-24 hours, turning the fillets in the bag occasionally to ensure they're evenly coated. - When the fish is ready to cook, preheat the oven to 450. - Line a baking sheet with aluminum foil and coat with non-stick cooking spray. - Remove the fish from the bag and lightly wipe off excess marinade before placing on the baking sheet. - Bake for 6-7 minutes. - Place the fish under the broiler for 2-3 minutes to get a nice glaze on top.